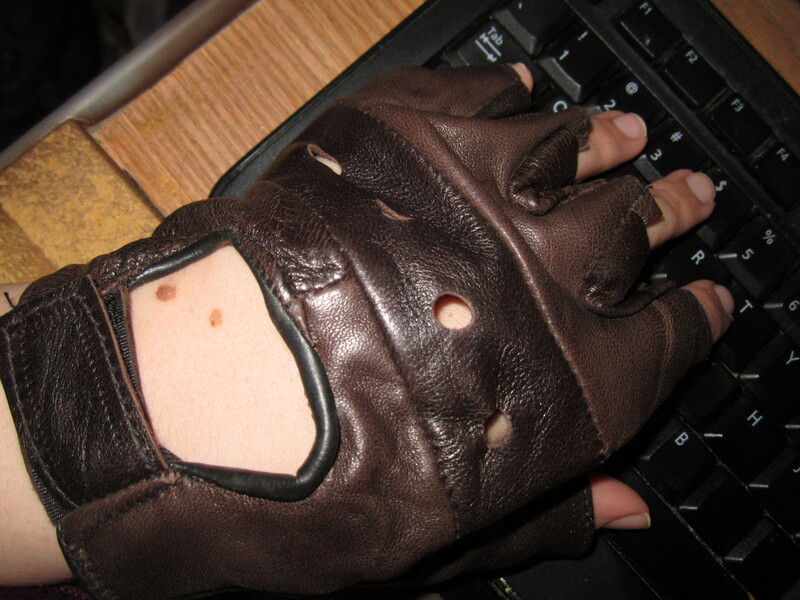 So, I found an excuse to own pleather gloves that stink like the real thing. Why? Because I had this wonderful idea of being a writer. Let me back up: I had the wonderful idea of what defined a real writer. Maybe. Read on. If you don’t know me from Bob, you might not know how devastatingly insecure I can be. My reasoning was that if I dressed a certain way, maybe the words would come quicker…and better. But props are props. It’s all in the mind. The psyche. The attitude and approach I take with my work. Cheap tricks can become not-so-cheap. First it’s gloves (which I can’t type in to save Dickens, I’m sorry.) Next it’s a tricorn hat that looks ridiculous atop my messy ‘do. What after that? Hmm? A trench coat for mysteries? A bouquet of realer-than-real-life (faux) blood-red roses? Did you know that on Valentine’s Day, some poor suckers pay an excess of $50 for half a doz of these (well, real) pollen-infested plants that are just going to die after turning their vase water a sickly (and stinky) green? But I digress. Writers write. We flounder. We flourish. We have seasons. But we always jump back into the game, gloves or no. Just some random rambling thoughts for you.